There are many families and retirees in Noosa who love to travel! We’ve helped our neighbours on several occasions by checking on their homes, taking in their bins and bringing in their mail. All while their homes are empty, in Noosa! With experience in business management, hotel services and property management, we decided to combine our professional experience. We provide Airbnb management service for around 20 holiday homes from Noosa down to Peregian. Airbnb is an online letting platform that allows users to list their homes for short term holiday rentals. A great option for those who want to earn an income whilst away on holidays. ​We also have great results for permanent holiday rentals. Managing a home on Airbnb and hosting guests is time consuming. It’s also something that most people don’t want to think about while on holidays. Did I book the cleaner? Have I sent the check-in details to the guests? Did I respond to that booking enquiry yesterday? I know when I’m on holidays I would rather be thinking of other things. Mel and I manage your Airbnb from start to finish. We list your home on Airbnb, take the photographs, take bookings, liaise with guests, organise cleaners, and take care of anything else that needs to be done. It’s up to us to make our visitors feel welcome. Tourism drives our business. Our guests are happy guests which means we get great reviews. We inspect each property prior to guests arriving, warmly meet each guest and genuinely enjoy informing travellers about the beautiful paradise we live in. We bring customer service and quality hospitality solutions to each listing – something often missed in the Airbnb space. We’ll be more than happy to come to you and have a chat! Check out this comparison between a permanent rental and an Airbnb in Noosa. Airbnb is an online letting platform that allows users to list their homes for short term holiday rentals. It’s a great concept, and when done right, can be very profitable. ​ Accommodation types available on Airbnb range from full time holiday homes, granny flats and garden studios to more unusual options such as house boats and tree houses. 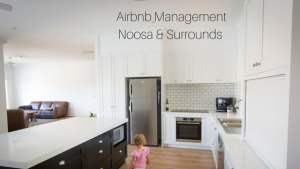 Airbnb management in Noosa is here! Airbnb is easy! Why do I need Team BnB to manage my Noosa holiday home?